As I continue to write down on paper the different ways the wrestling game will work, I realized that the exercise of mapping out the flow would be useful. At the end of the day, the pace of which the game moves incredibly important and something I want to nail down. The wrestlers stand face to face, probably in Squigglevision, which is where players choose which move to use (grapple, strike, or block). Then the "charging at each other" animation starts. Somewhere between 1.0 seconds to 2.0 seconds (probably?) the "ACTION" prompt appears, which is where the players press their action button as quickly as possible. 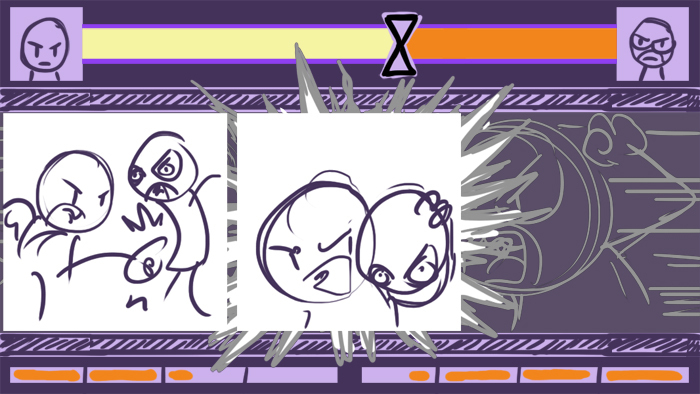 Once the buttons are locked, the game then shows a few panels in order to showcase the outcome. How it showcases the outcome is important and something that will probably only be solidified with actual motioned mockups. Does each panel come in one at a time, using the third on the right to see if the move was successful and for which wrestler? Does the game instead show a close up on the left, then the right, and then have an animated center panel showcasing the move? If so, how does a Create-A-Wrestler get animated? I can't possibly animated every single combination for every single move. I think this is a good place to start though for the actual demo of the game.